Here is my current project. I have a pair of 454 BBC in a 30' offshore boat. 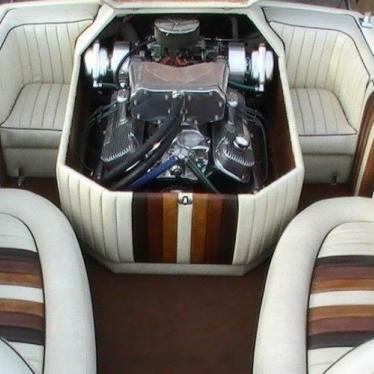 They are 330 hp engines with the larger oval port heads, Q-jet carb with thru hull exhaust, basically stock engines. I want to put twin turbos on the engines. Before everyone starts saying "just do a single" remember this is a boat and all the exhaust is water cooled. I have a pair of Gil center riser manifolds I am going to bolt the turbos too. This is going to be a low boost blow thru system. I want it to make 5 lbs because I don't want to have to plumb in a intercooler. max RPM will be 5000. Im shooting for about 500 hp. Yes I know heads and cam can get me there, but it doesnt have the same effect at the dock as twin snails when the hatches are open. I have looked at HX35 because I want an internal wastegate but not sure if they are small enough. I want to use ebay turbos too since I need to buy 4 of them and make water cooled heat shields, so no S400's for me, 4 of them is not in the budget. does anyone have a better solution than the HX35's? HX35s are probably small enough - I'd almost worry about them being too small, but they'll probably be OK for an engine in such a mild state of tune. With this being a boat, why not add an air to water intercooler? What about using HX40's Which blade count would be better for the HX40's? I though about an intercooler but that may be for the future. To intercool it I would be looking at $200 for an intercooler, $100 for piping, $100 brackets and misc, $100 for the water pickup, $100 for a water strainer, $50 hoses. total $650 per engine. I am along the same lines but with only a 21' boat and single 8.1L mercruiser (non-HO) with jet. I picked up an old school Banks TT 454 draw thru setup that came with a boost referenced carb (modified 850DP I think) and water cooled I/C, and watercooled logs n elbows etc. As my motor is MPFI I am going to reverse the intake manifold and feed the TB from the I/C (behind the engine). It is the only way to fit it down inside the doghouse. I have a holley hp ecu to allow for mis-tuning. Not to be your mother, but how do you alter the carbs to accept blow through and keep them CG compliant? If you use a pressurized carb box - be sure your floats are not hollow, as they might collapse. not my actual boat, this example has a Gen iv 454 but you get the idea. The Mercruiser has a big HE across the front.across the front forcing the TB up and top wont close. It uses old Rajay 301E10 turbos, old but tough and have carbon seals to allow air/fuel to be drawn thru. They say you gain 12% air flow by putting taking the fuel out of the intercooler. Good luck with your tricks. twin turbo bbc whats a good turbo to start with.